Support the Hybrid Fitness Blog. Be sure to Digg each article you read! Creatine is an ergogenic (muscle building) supplement, and numerous studies have proven its effect. “Extra creatine is therefore ergogenic, because it may help generate more power output during intense exercise.” (Exercise & Sports Nutrition Laboratory). Creatine has also been proven to increase strength, performance, and muscle mass. “In addition, long term creatine supplementation produces greater gains in strength and sprint performance and may increase lean body mass.” (Exercise & Sport Nutrition Laboratory). Other studies have proven creatine’s health benefits, not only to bodybuilders or athletes, but to non-athletic and aging individuals. “Recent creatine research suggests creatine may have therapeutic applications in aging populations[…]” (William D. Brink). Most people have no idea that creatine has such amazing health benefits as well as the obvious muscle building and energy providing one. 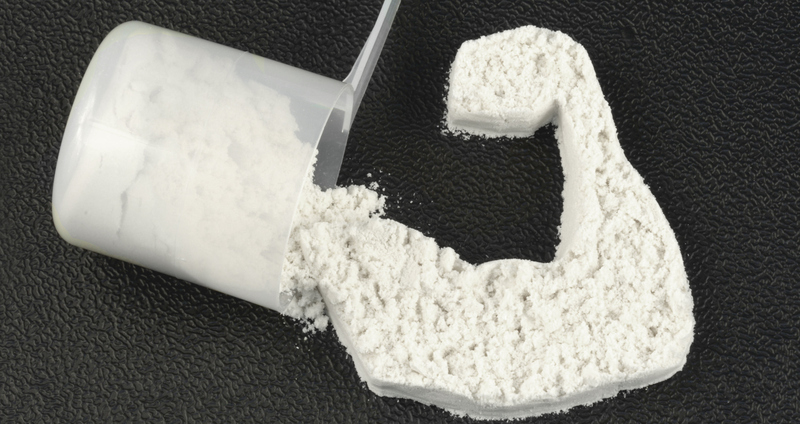 Believe it or not, research has shown that creatine can increase growth hormone production! Its no surprise that creatine is the most wide sold muscle building supplement in the world! Is there a difference between the various forms of creatine? Increases energy (ATP levels) for activities that require short bouts of quick energy such as lifting, sprinting, and HIIT cardio. Creatine is not a steroid! Sugar is not necessary for absorption of creatine, but it will help. There are easier ways for absorption such as using micronized creatine or CEE. Drink lots of water with creatine. Some people do not respond to monohydrate. Creatine causes some people to bloat or retain water. Taking creatine with sugar will increase absorption, but taking creatine with sugar and protein will double that! Micronized Creatine is essentially creatine monohydrate, except it has been micronized, which means the molecules of creatine have been divided or cut up. This increases their surface area 20 times, increasing absorption and reducing stomach discomfort. Essentially the same as monohydrate but with a larger surface area and smaller molecules, so the same amazing effects of monohydrate. Greatly reduces unwanted monohydrate side effects such as bloating and stomach discomfort. More effective than monohydrate, and most monohydrate non-responders should respond to this. Purer than monohydrate because it goes through more processes. I recommend that you purchase a Kilo at first. For the first 5-7 days load 25 grams per day, taking 5 grams per dose spread out throughout the day. I recommend that you place the whole serving (heaping teaspoon) directly into your mouth and wash it down with 8 oz. of grape juice. After the loading phase, I recommend 1-2, 5-GRAM servings per day. The first in upon waking or at least pre-workout. The second in the evening or post-workout as follows:Take the creatine with the protein and take the sugar after 1 hour. This will allow the insulin spike, protein spike, and creatine spike to be roughly at the same time. Insulin spikes occur roughly 30 min after ingesting the sugar, while protein and creatine tend to take about 90 minutes to be at their highest concentration in the blood stream. Hope all of this helps. TAKU’s NOTE: I have used creatine for many years, and found it to be safe and effective. After working with hundreds of clients using creatine I have found that it consistently improve strength, and assists in lean mass production. I have only encountered one seeming “non-responder”. I have never had anyone I was working with experience any negative side effects from taking creatine. Finally…Although I have used, and recommended creatine for year’s, and my experience is real and observed by me, it is still anecdotal. I suggest you buy some and find out for yourself. The above information is based on my own personal experience, as well as was gathered from various broad sources around the internet.